Pitcher was born in a village in West Yorkshire. She studied English Literature at Oxford University. Her first novel, My Sister Lives on the Mantelpiece, deals with the tragedy of a family torn apart by a terrorist attack. It quickly became a bestseller and has been translated into over twenty languages. It was shortlisted for the Red House Children’s Book Awards and the Galaxy Children’s Book of the Year, the 2012 Carnegie Medal and the 2011 Dylan Thomas Prize. It won a Royal Society of Authors’ Betty Trask Award, the Hull Children’s Book of the Year and the prestigious 2012 Branford Boase Award for most outstanding debut novel. Before her first book was published, Annabel trained as a teacher. 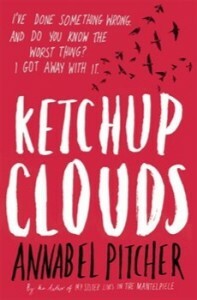 Ketchup Clouds: Zoe Collins has a secret – a dark and terrible secret that she dares confess to no one that she knows. But one day she hears of a criminal on death row who knows all about secrets. And lies. And betrayal. 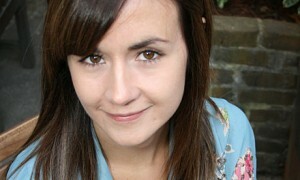 Desperate to confide in someone, Zoe picks up a pen and takes a deep breath.